Utah has not gone blue since Lyndon B. Johnson carried the state in 1964. In the fifty years and twelve elections that followed, the Republican candidate for President has carried Utah, cementing its status as a deep red state. However, new Utah polls suggest that the state is very much up for grabs, and Donald Trump may not even be the favorite to win it. The aggregate spread of the three most recent Utah polls show Donald Trump trailing independent candidate Evan McMullin by 0.67 points. 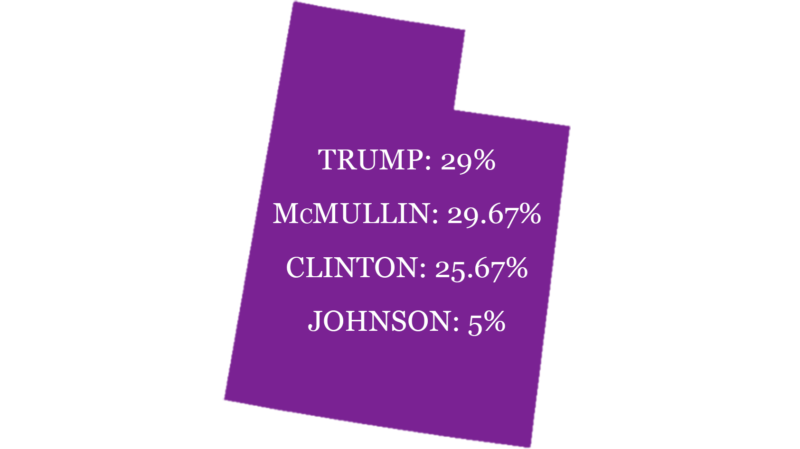 UtahPolicy/Dan Jones shows Trump +1; HeatStreet/Rasmussen show Trump +1; and Emerson shows McMullin +4. Evan McMullin’s recent surge in Utah polls has left many asking the question: ‘Well, who is he?’ Evan McMullin is a Mormon from Utah who served as a CIA operations officer and Chief Policy Director for the House Republican Conference in the United States House of Representatives. Though he previously affiliated himself with the Republican Party, he is currently running for president as an Independent. Republican candidates don’t just win Utah, they blow out their political opponents. That’s what makes Utah so interesting the cycle. Donald Trump is so unpopular in Utah that nearly three-fifths of the state has turned on him. What could be more interesting? The fact that Trump could still win. Despite the overwhelming dissatisfaction for Trump in Utah, he is still consistently polling at 30% or greater over the past few weeks. This plurality of voters may be enough to help Trump lock down the state, as Evan McMullin, Hillary Clinton, and Gary Johnson fight to split those who feel disenfranchised by Donald Trump. It’s important to note that Hillary Clinton has not cracked 30% in any recent Utah polls, making her bid to turn the state blue very much in doubt. Donald Trump’s unpopularity has turned Utah from a deep red state to one of the most fascinating races in 2016. Though it’s not considered a conventional swing state, Utah may wind up being the most interesting state to watch on November. And if by some small chance the election is decided by razor thin margins, Utah may be the state that decides who our next President will be.